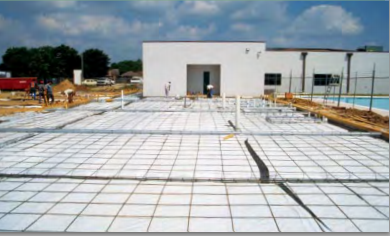 Quality under slab vapor barriers/retarders keep water/moisture from seeping into the building under the flooring! Moisture is sited as one the single most problematic issue that ruins flooring and coated surfaces. The key is to know how and where to install the vapor barrier so it can do its job property. Even arid climates need vapor retarders. Why? Because air conditioning an interior space/ room can create a significant difference in vapor pressure which may cause moisture to be drawn out of the ground through the slab and into the space above- the area of low vapor pressure. People also forget that landscape irrigation systems, planters, broken plumbing pipes and other water sources can lead to moisture problems, even in arid regions. Combines a reinforced high density polyethylene with a non-woven geotextile for an under slab vapor retarder with superior puncture resistance. Reinforced high density 5 ply. Offers greater strength and lower permeance for a higher level of integrity in roofing and under slab applications. ASTM Standards....Do you know the two standards for vapor retarders under concrete slabs? ASTM E-1745-11 “Standard Specifications for Water Vapor Retarders Used in Contact with Soil or Granular Fill Under Concrete Slabs”. ASTM E-1745-09 list three classifications which may be used to specify vapor retarders.This spec covers flexible sheet plastic/ membrane/liner material that is to be used as a vapor retarder.The membranes are classified into 3 classes. The materials shall be subject to tests for water vapor permeance, tensile strength, and puncture resistance. Under special conditions, the material shall also conform to the required flame spread, permeance after soil poison petroleum vehicle exposure, and permeance after exposure to ultraviolet light. Note that this particular test does not cover bituminous vapor retarders. The test is performed on new material that has been manufactured specifically for this purpose. ASTM E-1643-11 “Practice for Selection, Design, Installation and Inspection of Water Vapor Retarders Used in Contact with Earth or Granular Fill Under Concrete Slabs” Vapor retarders/ barriers main function is to offer a method of limiting water vapor transmission and capillary transport of water upward through concrete slabs on grade. The goal being to reduce the adverse results from water ruining floor finishes and interior humidity levels. Vapor barriers are not intended to provide a waterproofing function. Have a question about a vapor barrier?